Depicting monstrous bird-like creatures swooping on naked men, "Bird's Hell" -- painted between 1937 and 1938 -- is ranked among the most important anti-Nazi statements Beckmann ever made. 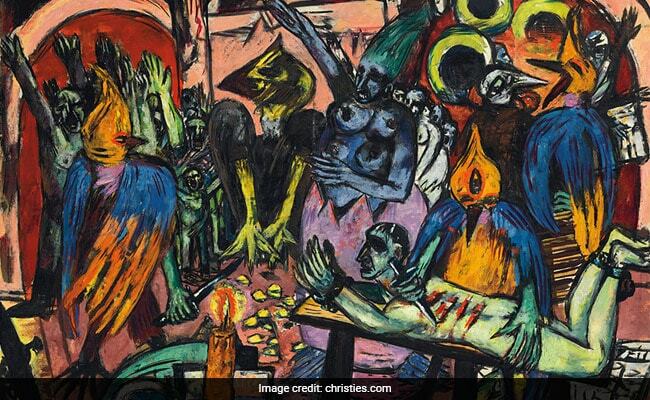 London, United Kingdom: Max Beckmann's "Bird's Hell" painting sold at Christie's impressionist and modern art sale for 36 million pound ($45.8 million, 40.8 million euros) on Tuesday, a new auction record for German expressionism. "This emblematic picture has become unanimously recognised as the Guernica of Expressionism and the international appetite was evidenced in the spirited bidding witnessed in the saleroom and on the phone," Adrien Meyer, Christie's international director of impressionist and modern art, said in a statement. Beckmann (1884-1950) enjoyed great acclaim in his native Germany with top art dealers presenting his work to private collectors until the Nazi regime labelled his works "degenerate" and removed them from German museums in 1937. He then left his native land for Amsterdam, where he lived in self-exile for a decade, before moving to the United States. He died in New York at the age of 66, on his way to the city's Metropolitan Museum of Art where his "Self-Portrait in Blue Jacket" was exhibited. Originally estimated in the region of $38 million, the sale of "Bird's Hell" easily broke the previous world auction record for a Beckmann, set in 2001 at $22.5 million.